The Taiwanese conglomerate Dyaco, renowned for manufacturing Sole products, also produces Spirit fitness equipment. Back in the early 2000s Dyaco bought the Spirit brand and has steadily upgraded its image, appearance and overall quality since then. 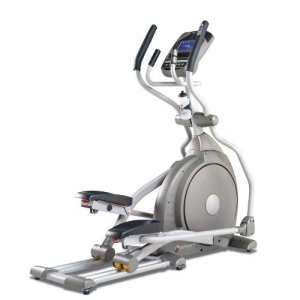 As the backing of a light commercial warranty and a maximum user capacity of 400lbs would suggest, this elliptical has rock solid build quality! When we gave it the rudimentary ‘shake test’ it certainly felt like it wasn’t going anywhere! That’s certainly good news ONCE the machine is installed but please bare those words in mind when it comes to moving it! There are transport wheels so it can be rolled but in terms of maneuverability it’s best to think of machines of this bulk as like a wheelbarrow full of bricks – you have to lift it first! That’s no easy feat -This elliptical weighs in at 187 lbs and has no folding mechanism, so it was clearly never designed as a lightweight space saver. However, the footprint of 71” x 28” x 63” is about as compact as one could expect whilst still offering an unrestrictive workout experience. Which brings us to the most important part – what’s it like in use? The flywheel accounts for over 2 stone! (30lbs) of this machine! Combining that type of over-kill engineering with some biomechanically spot-on design has resulted in a fantastically smooth and comfortable motion. At this price point you’d be entitled to expect some impressive specifications and you won’t be disappointed. For starters, the XE 295 has a 20” stride length that makes it ideal for long-limbed users. Being of the Sole/Spirit design the pedals also move in a naturally narrow path. Sharing the same ‘Q-factor’ design as all of their other elliptical cross trainers, the pedals have been inverted by 2 degrees to be even kinder on the joints. This VERY welcome feature is exclusive to the XE295 and XE395 models. Further upgrades to the cheaper XE195, is a heavier flywheel, a higher user weight capacity and handlebar controls. The one thing missing on both machines (but present on the XE395) is electronic incline. Given the price of this machine, the absence of incline was a slight disappointment. However, the superb standard motion at flat combined with a whopping 20 levels of resistance meant we didn’t feel too cheated! For effortless adjustment of the resistance, there are controls of + and – on the right hand dynamic arm. Those handles themselves are worthy of a mention too -They are commercially styled, thick, ‘grippy’ and a joy to use. Mounted on the static handles are the pulse grip sensors to monitor your heart rate if you don’t happen to be wearing a compatible chest belt transmitter. If you do, then you can utilize a couple of heart rate controlled options. With regards to programs on offer, the selection is limited. You have the choice of Fat Burn, Cardio, Strength, Interval, Hill and Manual. However, there is space for 2 user-defined programs for you to build your own custom workouts, so there’s potential for variation there. That said, we really cannot justify why at this budget, Spirit have not at least doubled the quantity of pre-set profiles. Instead the innovative design ideas seem to have been appointed to other areas. There is a heart rate % profile gauge to the right of the console allowing you to keep a check of your % compared to the maximum projected heart rate (calculated by the age that you entered while setting up any program) The LED lights up in Amber for 50-60%, Green for 65% to 80%, and Red for 85%+. Now let’s see if you know your own body……… If you hold the static handles and just use your lower body… guess what muscles you’ll be using?? Bing! Yes your legs! Well with the XE295 there’s no need to guess. The completely obvious is highlighted with a small body chart with LED lights on each of the major muscle groups. These are said to activate in three degrees of engagement: Green represents minimal involvement, Amber medium involvement, and Red, full or heavy involvement. In reality the computer really didn’t tell us anything that our muscles didn’t tell us far sooner! It is all rather obvious and superfluous BUT if nothing else the little LED’s offered a bit more colour to an otherwise dull console. To stop your brain from overheating from such stimulation (!) there is a fan mounted beneath the display screen. We personally think that the water bottle holder will allow for much greater refreshment than the small amount of cool air coming from the fan. The adjustable vents can direct whatever breeze is generated but unfortunately a substantial portion of the fan blades must be mounted behind that display screen which acts as a windbreak. The whole console also tilts by up to 10%. This isn’t for the benefit of the fan but rather for visibility purposes, to ensure you can angle the display to your eye line or to avoid any glare from overhead lighting. Mirrored to the right of the fan button is a jack plug for your MP3, which can be played through the 2 speakers at the top of the console. Your player or perhaps a phone (if small enough) can sit in a slim slot in the console. So overall, Spirit have had a fair attempt at providing some ‘extras’ to enhance the user experience but frankly speaking, the XE295 is less about ‘bells and whistles’ and aimed more at durability and performance. 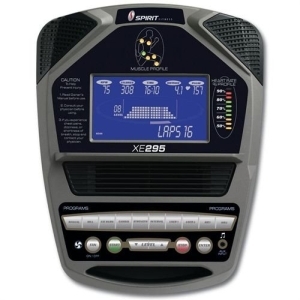 What it lacks in program variety, is more than made up for by what is most important to serious users – The comfort of a beautifully designed elliptical motion that’s safe on the joints – A load of resistance levels – and a warranty that makes this a great value ‘lifetime’ investment in your fitness! The Spirit XE295 is not currently available from any retailers we're aware of in the UK. Spirit Fitness machines are designed for light commercial use in hotel gyms or offices and hence they're designed to take some punishment! So, if you've got the room and the budget for this rock solid, no non-sense cross trainer, it's a good choice! 13.5kg/30lbs flywheel (Inertia Weight: 37kg/81.5lbs).